The goodies at Juicy Stakes Poker just keep on coming. A seat into the $500 GTD monthly event the latest treat on offer in the online poker site's summer of giveaways. To earn your seat in the tournament, simply play 10 or more ring game hands from stakes of $0.02/0.04 up to $0.10/0.20. If Sit n Go tournaments are more your bag, just play in 10 with buy-in of up to $3 and you'll book your place. Players have until 30 June to complete the qualifiers. Tokens will appear in players' accounts on 3 July with the tournament itself following on 5 July. 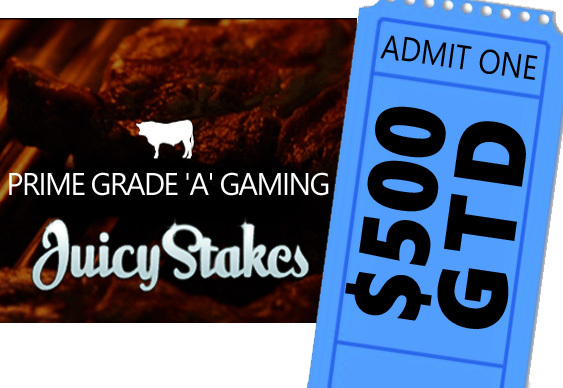 “We like to reward our loyal customers at Juicy Stakes and as the temperatures rise this summer, the lucrative $500 Guaranteed Tournament is well worth checking out,” said Juicy Stakes’ online casino manager. Players at the site have already enjoyed free video poker and extra hands on the site's recently upgraded online blackjack tables. New visitors to the Juicy Stakes poker tables can look forward to a 200% first deposit bonus worth up to $500. Sign up at JuicyStakes.eu.